All text, unless otherwise noted, photos and title graphics - © copyright Allen W. Wright, 2004. Founded in 1997, the Robin Hood academic conferences have certainly been a high point in my life. Scholars gather to discuss all things Robin Hood -- from historical outlaws and the earliest ballads to 17th century theatre to the most recent films. It provides a lively exchange of ideas, but it also does much more. Originally, this began as part of the Personal Journey section of my website. And if it seems a little more personal than most spotlight reviews that's because for this event I was as much an actor as an auditor. The accommodations were at York St. John College, just across from Robin Hood's Tower, part of the city's medieval walls. 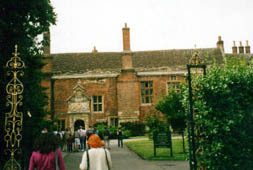 The lectures were delivered a short walk away at King's Manor. King's Manor is virtually next door to the ruins of St. Mary's Abbey, home of abbot who was Robin's legendary archenemy. I first visited the abbey in 1993, and I was able to squeeze in a brief walk around the abbey grounds into the busy conference schedule. Unfortunately, I didn't have much time to sample the many sights of York this time. I did go shopping with some friends along the pedestrian shopping street of Stonegate and wandered down the old-fashioned Shambles after store hours. And I did an early morning stroll along the medieval wall. But then, this trip had many, many more pleasures than the tourist attractions. Before arriving in York, I briefly visited Huddersfield (not far from Robin Hood's grave) and crashed at David Hepworth's. Leaving things to the last minute, I banged out the finishing touches to my paper on David's spare computer. Then on Sunday, I headed to York by train. My last minute writing spree meant I was too late to visit attractions such as the Jorvik Viking Museum. But that didn't matter too much. Almost immediately upon my arrival, I met up with old friends -- like Alan Gaylord, Lorraine, Sherron, Laura, John, Helen and many others. During the dinner, Alison (who also designed the look of my website) and Kirsty -- dear friends from both email and the 1999 Nottingham conference -- turned up and we went out for a bit. When I returned to our accommodations, I crashed into the lumpy mattress which buckled under my girth. Still, I was able sleep and be somewhat refreshed for the conference proper. For the first time since the original 1997 conference, none of the papers were in competition. I was able to attend virtually everything at the conference. Monday, July 7, began with the "Plenary" lecture by Mark Ormond on representations of royal authority in the Robin Hood legend. Then, Laura, Charlotte, Sherron and I headed to the Teddy Bear tea shop in Stonegate for cheese sandwiches, tea and scones with clotted cream and strawberries. After lunch, Anthony Pollard talked about the popular history in early Robin Hood stories (which look back to Edward III's "golden age" of legend if not reality). Andrew Hamer examined the Icelandic outlaw tale of Njas Saga. And David Hepworth gave us a glimpse at the real life medieval outlaws and robberies around Robin Hood's Yorkshire haunts. More tea. Then, Glyn Burgess looked at the Ranulf/Randolfs, earls of Chester. He concludes that Ranulf III, an in-law of the earl of Huntingdon, is most likely the one whose "rymes" are alluded to in the first Robin Hood literary reference. Conference organizer (and one of the nicest people one could ever meet) Helen Phillips looked at the "Chartist Robin Hood", mentioning references to Robin in the works of Bronte among other things. Patricia Yongue looked at the Robin Hood allusions in the modern-day novels of late 19th and early 20th century novelist Willa Cather. After dinner, Paul Bracken of the University of Nottingham entertained us his delightful versions of classic Robin Hood ballads and other medieval music -- including "Robin Hood and his meiny", an excerpt from the Gest, and Robin Hood and the Bishop of Hereford. For an encore, he sang a funny composition of about Charles de Gaulle. I hope that Paul will release a CD of his Robin Hood ballads to stand alongside Bob Frank's own marvellous version of the Gest. Tuesday, July 7, began with Sayre Greenfield's paper entitled "May the Forest Be with You" -- not about a certain 1970s sci-fi film but rather Ben Jonson's unfinished Robin Hood play, The Sad Shepherd. Eila Williamson detailed Robin's many appearances in medieval and post-medieval Scotland. Then, it was time for coffee to chase away some lingering jet lag. Next up, Lois Potter delivered her plenary lecture "Playing Robin Hood". With the help of Sayre Greenfield, Linda Troost and Lorraine Stock, Lois gave a very lively examination of Robin's theatrical history. Sayre and Linda performed the roles of Robin and the evil knight, showing the improvisation needed when performing a ballad-like archery sequence like the one from the 1475 play. They staged alternate versions of lines 9 and 10 with Sayre showing disappointed as he mimes missing the target. "Y cleve ... not ... the styke." And Linda jumping for joy as Sayre resignedly announced "You cleve the styke." All four players performed a disguise farce scene from Anthony Munday's The Downfall of Robert, Earle of Huntington (lines 569-636, approximately) with Lorraine as a delightfully lusty Elinor. At lunchtime, David Hepworth and I hosted an informal discussion about Robin Hood on the internet. Of course, some of it was spent discussing my website. After lunch, John Marshall had us in stitches as he described the comedy of errors at the Ripon Millenary festival of 1886. 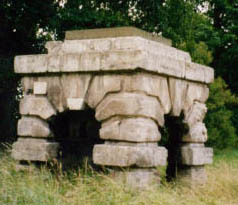 D'Arcy Ferrers, master of revels, tackled the organizational nightmare in re-enacting the meeting of Robin Hood and the Curtal Friar at the "traditional spot" at Fountains Abbey. (One proposed script called for 50 arrow-catching dogs as in the ballad. The writer suggested the dogs could perform if starved for days.) Then, Maid Marian scholar Sherron Lux explored three "Forgotten Robin Hood Novels of the Mid-Twentieth Century". The Naked Sword (1959) by Donald Barr Chidsey inserts Robin Hood into the Fouke fitz Waryn story and The Nut Brown Maid by Philip Linsday combines the characters from the non-Robin Hood ballad of the same title with feet-of-clay versions of Robin and Marian. (Like the later film Robin and Marian, Marian is at least partly responsible for Robin's death.) The Nut Brown Maid is Sherron's favourite of the three. But I was most amused by her least favourite The Last of the Greenwood (1975) by Sharon Whitby. It sounds absolutely dreadful in its over-the-top pagan portrayal of Robin Hood and Marian as the craft names of whoever is serving as the Green Man and Snake Maiden. After another break for hot caffeine, Dean Hoffman discussed a Manor House staging of The Tale of Gamelyn. The final paper of the day came from Barbara Green who looked at the possible historical culprits of Robin Hood's murder and shed light on "The Riddle of the Prioress." Tuesday evening, Linda Troost directed us in a communal reading of Ben Jonson's The Sad Shepherd. I had the dual role of Friar Tuck and Puck-Hairy. My performance was, regrettably, more worthy of Robin Starveling than the Robin Goodfellow I was attempting to portray. Luckily, there were several superb performances. Linda and Sayre brought Marian and Robin to life. Scriptwriter Michael Eaton played a wonderfully weepy sad shepherd that was still infused with his natural jovial charm. But the stand-out performance was by Stephen Knight. Stephen's often called the top Robin Hood scholar, but it's clear he'd be equally adept in panto. Donning a fake nose, he played Maudlin, the witch of Papplewick. When Maudlin assumed Marian's form, he donned a bad blonde wig. After the performance, some of us gathered around a picnic bench under the greenwood tree. The campus was also playing host a chaplain's conference. A young and rather rotund chaplain stumbled by with two bottles in hand. He announced that he knew bugger all about Robin Hood, but that he did have gin and tonic. Could he join us? Of course we said yes, and he proceeded to express his love of post-modernism which drew the ire of one scholar. Then our legless man-of-God insisted that another Robin Hood scholar would weep continuously if only he knew the power of true love -- the love of God. Wednesday morning, I delivered my paper called "Beating and Binding in a Shaky Liturgical Era: Religion and the Modern Robin Hood Legend." As an introduction I mentioned last night's clerical visitor and said I felt my paper had been blessed by Friar Tuck. At the last conference, I delivered a paper on the sheriff. This year's paper wasn't an example of a continuing interest in Robin's foes as some have suggested. Rather, I'd like to think it continues the themes of my papers on Robin Hood comics and the sheriff. In part, they examine the basic outlaw nature of Robin and how his activities have been modified to be more acceptable. Before my paper, Lorraine Stock looked at the role of disguise, green clothing and the reference to Robin has the "Mayster-herte" in the Gest. Tim Jones discussed Howard Pyle's Robin Hood. After my paper and tea, Thomas Ohlgren delivered the final plenary lecture. Once again, he examined the manuscripts of the Potter and Monk ballads and this time turned his attention to finding new details in the early printed texts of the Gest. After lunch, Laura Blunk talked about "Sibling Royalty" and the shifting portrayals of Kings Richard and John in the history books and films (some intriguingly obscure). Lesley Coote and Brian Levy teamed up to take a psychoanalytic approach to the "Gender Problem" in Robin Hood films. In a similar vein, Roberta Staples investigated "Marian as anima". After still more tea and coffee, the final three papers were presented. Thea Somerfield looked at another gentleman named Robert who had a brush with the outlaw genre, Robert the Bruce. Mary Hamel discussed "Robin Hood and Star Trek", focusing on the outlaw's appearance in the Next Generation episode "Q-Pid". Finally, Stephen Knight spoke on "Robin Hood and the Crusades" or so his title claimed. In fact, Stephen analyzed the social implication of Robin Hood riding a horse. After having us sing the Richard Greene theme with its "Riding through the glen" lyric, he produced a slide of the woodcut of the yeoman on horseback and announced "But I want to interrogate this guy". It was a witty end to a great three days of Robin Hood papers. But not quite the end of the conference. I participated in a discussion about the merits and faults of Kevin Costner's Prince of Thieves. The session was chaired by Alan Gaylord, a fine scholar, gentleman, friend -- and interestingly someone who defends the film. In another room, Lorraine Stock chaired a session on teaching Robin Hood. I wish I could have been there as well, but Helen Philips managed an organizational miracle in making nearly all of the conference plenary. At the end of Wednesday, we had a pleasant banquet and posed for group photos. One of the great themes of the legend itself is a sense of an alternative community. And that sense of community, fellowship, yeomanry certainly exists among Robin Hood scholars. At least a few have called us Merry Men and Women. If there's any sad note to this conference, it's that a few of our intrepid band of scholars could not attend this conference. Tom Hahn, who originated the conferences in 1997, had to bow out at the last moment. 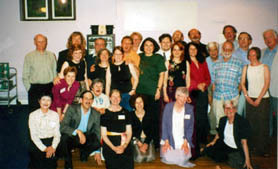 Most tragically, Julian Wasserman passed away shortly before the 2003 conference. Julian not only provided the previous conferences with some entertaining and informative papers. He also provided a warm, humanity and friendship to all those that knew him. The scholarly greenwood is certainly poorer for his absence. But some new members joined our roguish band. One such person was surprised and impressed at just being able to chat with scholars like Tom Ohlgren. 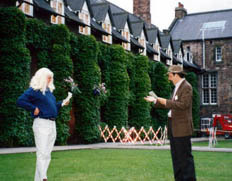 It mirrored my own feelings when I chatted socially with Barrie Dobson way back at the 1997 Rochester conference. I hope she'll enjoy them the conferences as much as I have. Thursday, July 10, was the last day of the conference. We boarded a coach (bus) and headed to some Yorkshire Robin Hood locations. Our first stop was in Wentbridge and then walking to what used to be "the Saylis" from the Gest. A visit to the Barnsdale regions of the early ballads was long delayed. On the locations tour of the 1999 conference, our coach broke down and nearly fell into a mill pond. So we had to cancel the Barnsdale trip that time. Fortunately, this time the coach didn't break down. After the Sayles, but still in the Barnsdale area, we visited Robin Hood's Well (well ... one of them, anyway). Then, we sped by sites like Wakefield's "Pinderfields" where a legendary George a Green would have worked. And finally stopped in Ripon to tour the cathedral. But it was the last stop that was the highlight of the tour (for me, anyway). Fountains Abbey, according to one ballad, was the home of a Curtal Friar commonly called Tuck. The abbey ruins were enormous and I could have easily spent the whole day there. One Yorkshire scholar said he hadn't forgotten how lucky he was to live in the county. "This is a classic day trip for me." Unfortunately, time was pressing. After about an hour and a bit of exploring Tuck's legendary abode, we boarded the coach and headed back to York. Paul Bracken and I caught a train to Nottingham and I visited a few Robin Hood sites on my own. But I hope in 2005, this merry band of scholars will meet again. I'd like to give an extra large thanks to Helen and Stephen for arranging such a wonderful conference. My Further Adventures in Robin Hood Country has a more complete account of the Yorkshire tour. Text copyright, © Allen W. Wright, 1997 - 2004.